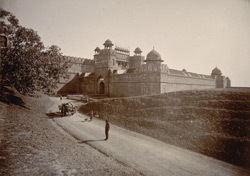 Photograph of the Delhi Gate at the Red Fort in Delhi from the Curzon Collection, taken by Lala Deen Dayal in the 1890s, from the Curzon Collection: 'Views of places proposed to be visited by Their Excellencies Lord & Lady Curzon during Autumn Tour 1902'. The Delhi gate is one of two main entrances to the Lal Qila or Red Fort, the palace citadel built in the 1640s by the Mughal emperor Shah Jahan (r.1627-1658) as the headquarters of his new capital, Shahjahanabad. The palace apartments are contained within a fortification wall built of red sandstone, surrounded on three sides by a moat and on the fourth by the river Yamuna. This is a general view of the gate from outside the fort, showing the bastions, battlements, chhatris and turrets which crown the walls.